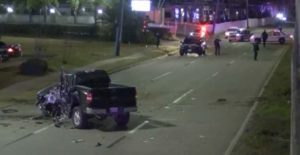 Houston (January 12, 2019) – A man died on Saturday night after his truck crashed into an exit ramp on Interstate 45 in southeast Houston. The car accident occurred around 11:30 p.m. in the 14100 block of Gulf Freeway service road. The victim was driving a black Ford F-150 truck heading south near the Dixie Farm exit when he lost control of the vehicle. The truck collided into part of the HOV exit ramp and spun back out in the feeder lanes. The truck was mangled and car parts scattered across the roadway. The male victim, 50, was pronounced dead at the scene. His identity is pending verification by the Harris County Institute of Forensic Sciences. There were no other individuals or vehicles involved in the accident. The cause of the crash is unknown. Authorities could not indicate whether any signs of alcohol were involved. Crash investigators will review all factors that may have led up to the accident. If you or a loved one were involved in a car accident, it is important to contact a car accident attorney to help you evaluate your options. Call (713) 987-7111 or send us an email to discuss your car accident injury case.